Lunch is traditionally the main meal of the day and most people have only smaller meals for dinner (light meals, sandwiches, essentially things you would have for lunch in the Anglo-American sphere). Snacks and fast food are common (like in all countries) and often regionally distinct. Breads and rolls come in large varieties in Austria and serve as a basis for many snacks. The classic bread roll is the "Semmel", ideally handmade (you can tell from the imperfections in the geometry - this is serious business). Other bread rolls come in various shapes, with different grains and spices and demonstrate why a baker is a highly respected person in every Austrian village. Ask for Salzstangerl, Fintschgerl, Kürbiskernweckerl, Kipferl, Mohnflesserl, Laugenstangerl and Kornspitz. Bread rolls and Semmeln are always sold on the day - I remember arriving in England and realising that this is not granted in every country. Semmeln can be filled with cut sausages, other cold cuts, served with boiled sausages, filled with cheese or spreads or eaten with soups or goulash. 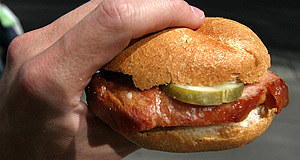 Try the cheese-spread "Liptauer" and don′t leave Austria without having tried a "Leberkässemmel" (Leberkäse is non-vegetarian, but don′t ask for further details). "Verhackert" is a spread based on bacon and common in Styria. "Erdäpfelkas" is potato-based spread typically Upper Austrian. And Tyrol is famous for its high-quality smoked bacon. You will get such things in the fresh-food section of every supermarket, at butchers and partly at the many "Würstelstand" (sausage vans) in cities. Here you can also get Käsekrainer, a boiled sausage with small pieces of cheese. If you want to fake familiarity with local culture, order a "Eitrige mid am Bugl" (this very sausage with an end-piece of bread or a Semmel, expressed with Eastern Austrian slang terms). In Western Austria, the Bosna is a typical snack: a piece of crunchy white bread with a sausage, roasted onions, curry and mustard - not dissimilar to the American hotdog. Especially in Salzburg you will also find Bavarian-style, white sausages, often eaten with white beer and pretzel or Semmeln. Another sausage - probably Austria′s most popular one - is the "Frankfurter" (similar to what is called a "Wiener"). Sausages of this style were known in Central Germany since the Middle Ages. The butcher Johann Georg Lahner (1772 to 1845) had learned his craft in Frankfurt, where first got into touch with such sausages. In the early 19th century, he moved to Vienna and from around 1805, he sold his sausages in the Neustiftgasse 111 in a local variation with a mix of pork and beef. The "Frankfurt" sausage spread quickly and entered Germany and other countries as "Vienna Sausage" or "Wiener Sausage". This is why today the same sausage is called "Wiener" in Frankfurt and "Frankfurter" in Wien (Vienna). It is boiled and most basically served with a Semmel and mustard. It is also used in soups, goulash and stews. Speaking of goulash: Austrian Gulasch is not the same as the Hungarian dish with the same name. There are many variations, but the basic goulash it thicker than the Hungarian one and distinctly Viennese. It is a spicy dish with beef and typically served with a bread dumpling (Semmelknödel or Serviettenknödel).